This item comes equipped with Gold Champagne Crystal glass. Impress Guests With The Glamorous Brax Collection Of Lighting. Strands Of Sparkling, Top Quality K9 Crystals Are Surrounded By A Distinctive Geometric Frame In Washed Gold. Absolutely Stunning. Gleaming chrome and crystal lined rings hang from a chain to orbit and enchant. Crystals placed inside the orbit to a nice reflective light look. A modern style light with light flair. Stunning champagne glass shade is a gorgeous scalloped shell. Quality cut crystal brings sparkling reflections in to room with a dramatic effect. Antique finish with added motif accents on finial and ceiling plate. 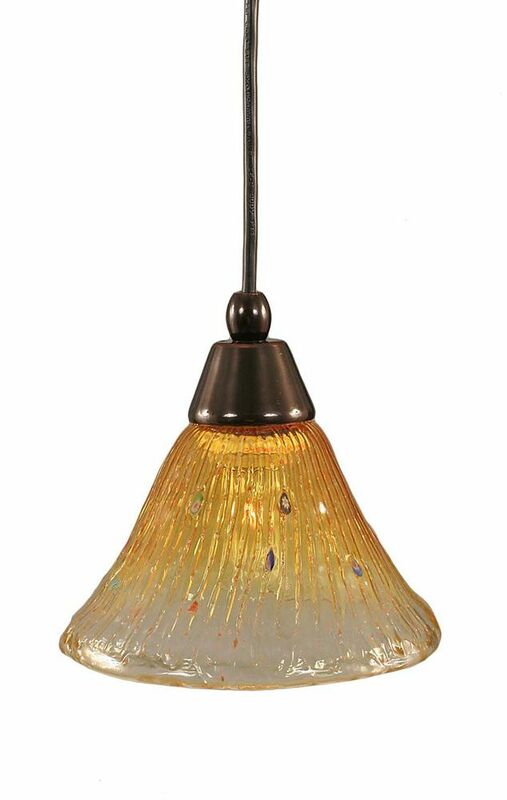 Concord 1-Light Ceiling Black Copper Pendant with a Gold Champagne Crystal Glass The cornerstone of the concord Collection is quality, and this pendant is no exception. Combining a classic black copper finish and posh styling, you will find no better way to highlight the charm of your home. With the superb craftsmanship and affordable price this fixture is sure to tastefully indulge your extravagant side.